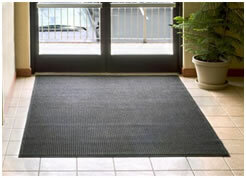 There are many reasons why floor mats are a practical and versatile option to place within your facility. For starters, they keep your floors clean and safe. Much of the dirt from people’s shoes is wiped off at the entrance when they walk in, reducing the amount of mess tracked into your facility. This also serves to reduce extra cleaning costs as compared to facilities that don’t have mat services. In wet weather conditions, water or snow is also wiped from shoes and boots before people enter, not only reducing mess, but more importantly decreasing the danger of someone slipping or falling and obtaining an injury from wet floors. 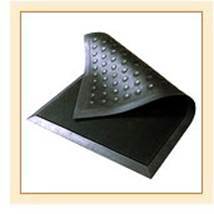 Sanitec Solutions Inc. offers our customers slip resistant, water absorbent floor mats, designed to control dust, dirt, mud and water. When you use our mat services, you will benefit from competitive prices with no delivery fees or fuel surcharges, no extra environmental charges, and most conveniently no contracts are required. We have one easy flat fee so you can plan and stay on budget. We don’t require any complicated, long term contracts that lock you into our company. At Sanitec Solutions Inc., we always give our customers freedom of choice. This inspires us to retain our customers by going above and beyond our competition, delivering unsurpassed service, and top quality products. Regularly changed, clean mats give a better appearance to your facility. Provides brushing action to dislodge soil from bottom of shoes. Indoor air quality is improved by reducing dust. Roll out a Sanitec Mat Services program today. Give us a call to find out how easy and affordable it is to get Sanitec mat services in your facility.